Chia Seeds by Bob's Red Mill - The Mayans and Aztecs Superfood of Energy meaning "Strength"
Chia the traditional of MesoAmerica is High in fiber, a good source of omega 3 that you can have in a refreshing drink, sprinkled on your cereal or used in baking cookies or muffins. 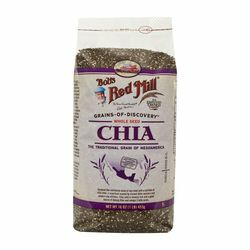 Chia gives you energy and increase of stamina. La Chia sirve para curar ulceras. Es refrescante y ayuda a quitar el estrenimiento. Contiene mucha fibra y omega 3.